Automated Environments designs, installs and programs integrated control and automation systems for residential and commercial applications. 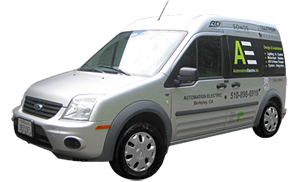 As licensed electrical contractors serving the San Francisco Bay Area, we tie electrical, lighting, motorized shades, audio, video, telephone, data, alarm and surveillance systems together. Have your outside lights come on at dusk, draperies close automagically during the day to protect carpets and art from fading, have your stereo drizzle you with music throughout your house, or watch a movie with a simple push on your remote. "I am the owner of an award-winning Piedmont contracting firm. I have been in the business since 1993 and worked with at least 20 electricians. René is hands down the best. His knowledge about LEDs and current lighting and his honesty and more-than-competitive pricing make my company look awesome." "Automated Environments installed a projector and webcam in our conference room. We had 20 people coming on Friday and René got everything done on time... very flexible and professional." © 2019 Automated Environments, Inc. All Rights Reserved.